You guys. We had a break through yesterday. My sweet, lovely daughter – the 13 year old – is not much for vegetables. I mean, this is probably pretty normal and I try to remember that I also did not eat vegetables as a child and I survived. I still keep trying to push the veggies though. Yesterday, for dinner, I told her we were having chicken. Cheese stuffed chicken breast, to be exact. I left out the fact that there was spinach lurking in the cheese. She’s not blind, so she totally saw it in there but just went with it. You guys. She ate that entire piece of chicken. 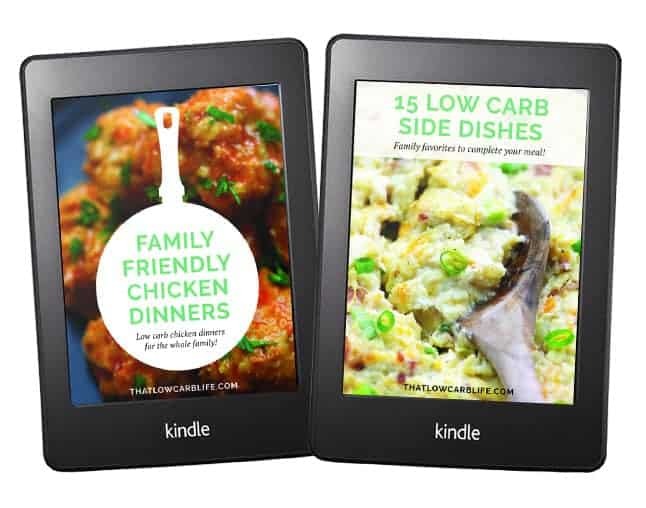 Alongside a serving of pan fried Brussels sprouts. Like, woah. Anyway, I now believe that this baked stuffed chicken breast recipe is magic. It’s also easy and delicious and you’re going to love it! You’re going to start by mixing up your spinach filling. 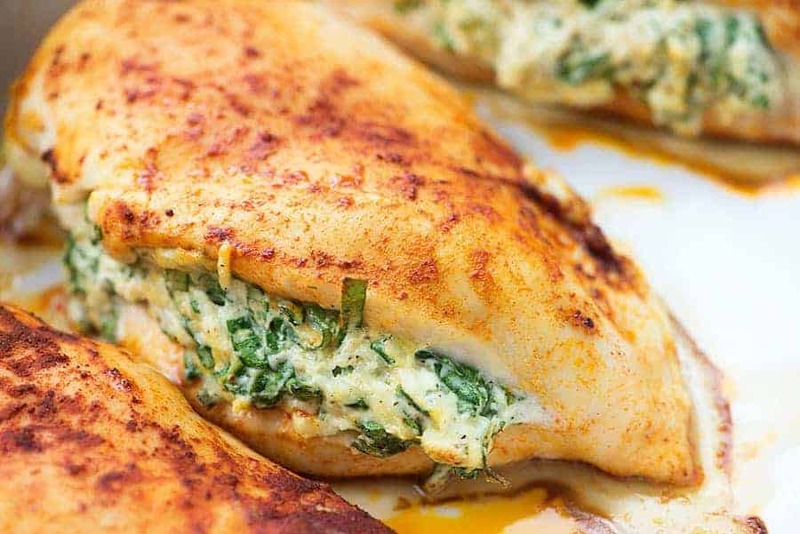 You’ll want some cream cheese, Parmesan, a little mayo, chopped spinach, and seasonings. Basic stuff, friends. Mix that all together in a small bowl and then set it aside. Grab a pack of boneless, skinless chicken breasts. The filling should be the perfect amount for 4 breasts. Season the chicken breasts and then take a sharp knife cut a little pocket in one side of the chicken. 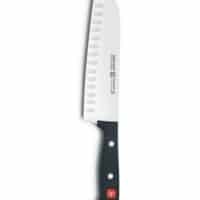 I do this by placing one hand on top of the chicken to hold it steady and then using a sharp knife to slice halfway through the breast, like you would do if you were butterflying it, but stopping about halfway into the chicken. Watch my video below to see this step if it sounds tricky. It really is easy, promise. 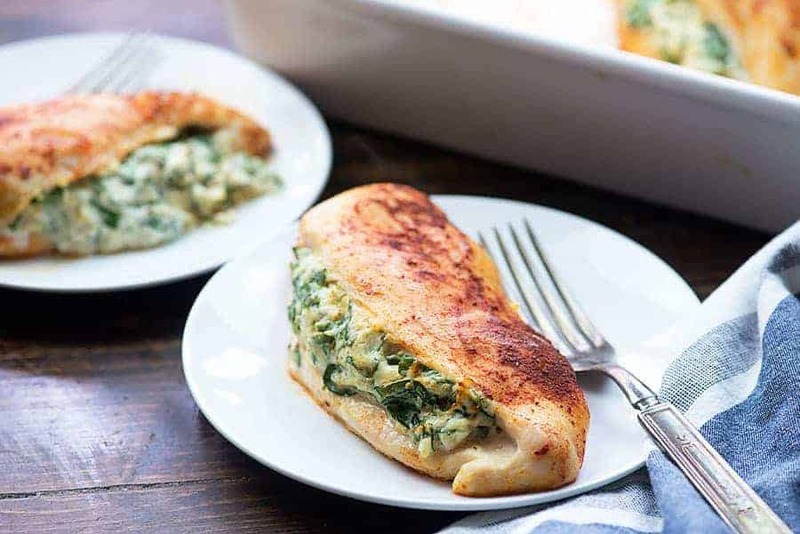 Now just start spooning that spinach filling into the little pocket in your chicken! Bake these for 25 minutes or until the chicken is fully cooked. 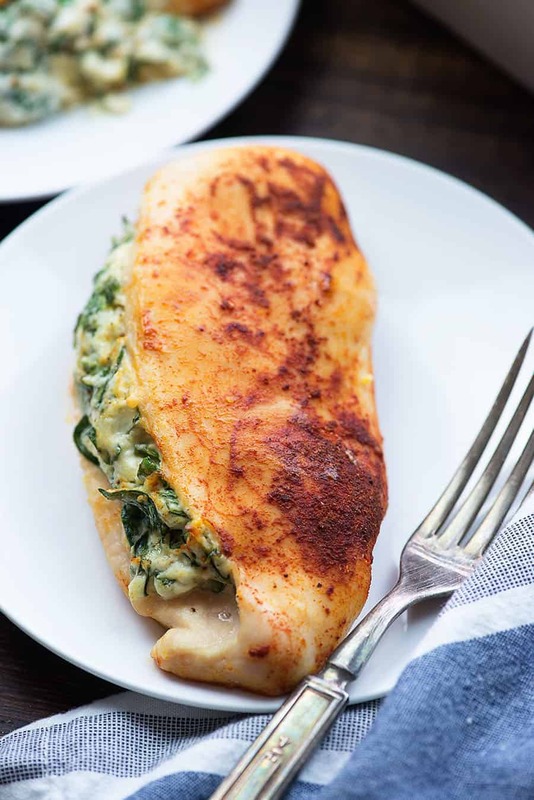 This cream cheese stuffed chicken breast recipe is perfect for your keto diet. I could pretty much live on cream cheese and it’s kind of perfect for keto. So low in carbs and high in fat with little protein. The spinach is a great way to get some potassium in. I’m a stickler for staying on top of my electrolytes. I can always feel it when they get out of whack and it just ruins my whole day. Nobody needs to walk around feeling like they’re going to faint any minute, you know? Do you guys watch your electrolytes pretty closely while following a keto lifestyle? It’s so important! 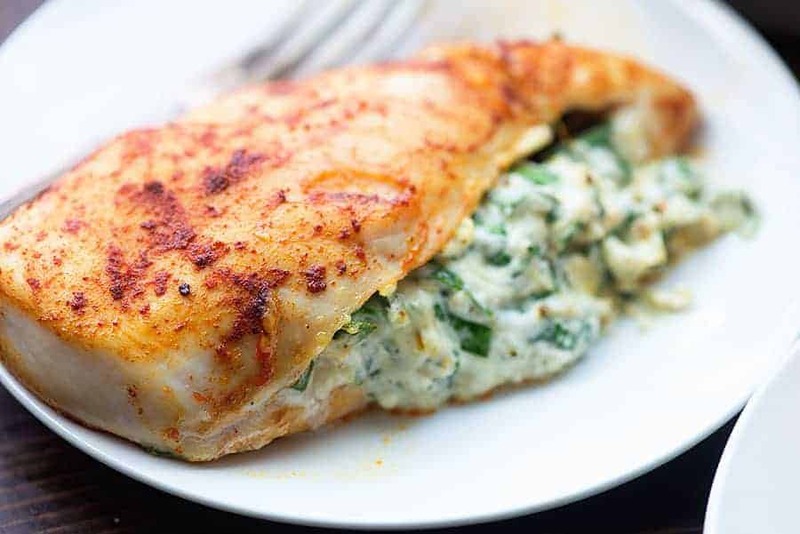 This baked stuffed chicken breast recipe is ready in just 35 minutes! Okay, friends. 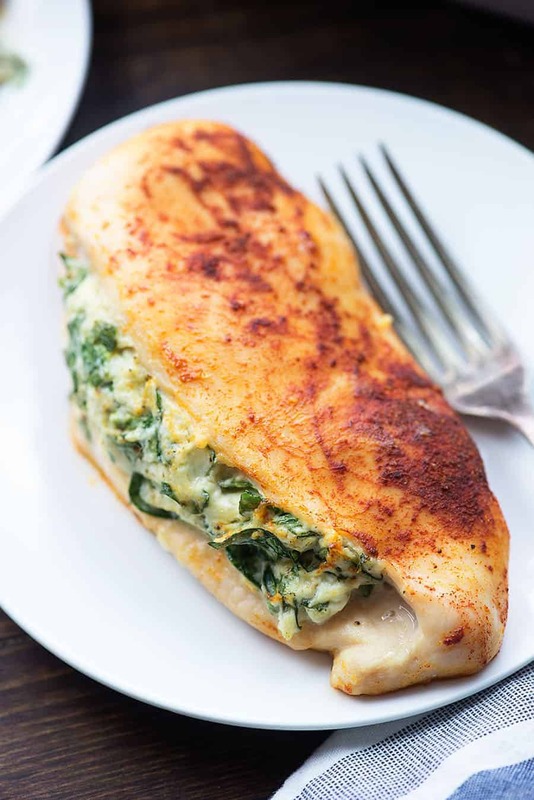 I’m including a video below to show you just how easy this spinach stuffed chicken is! I hope you guys give this a try and let me know what you and your family thinks. I hope it’s a big hit. 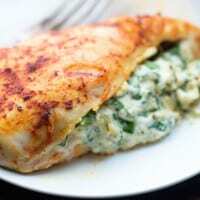 Jalapeno Popper Stuffed Chicken – this one is wrapped in bacon, so you know it’s amazing. Broccoli Salad – this one is packed with cheddar and bacon! Broccoli Cheese Casserole – if you love cheesy casseroles, this is a side dish you don’t want to miss! Teriyaki Chicken Stir Fry – low carb and so good! If you like this recipe, you’ll want to check out my eBooks full of family friendly recipes! Visit the shop! 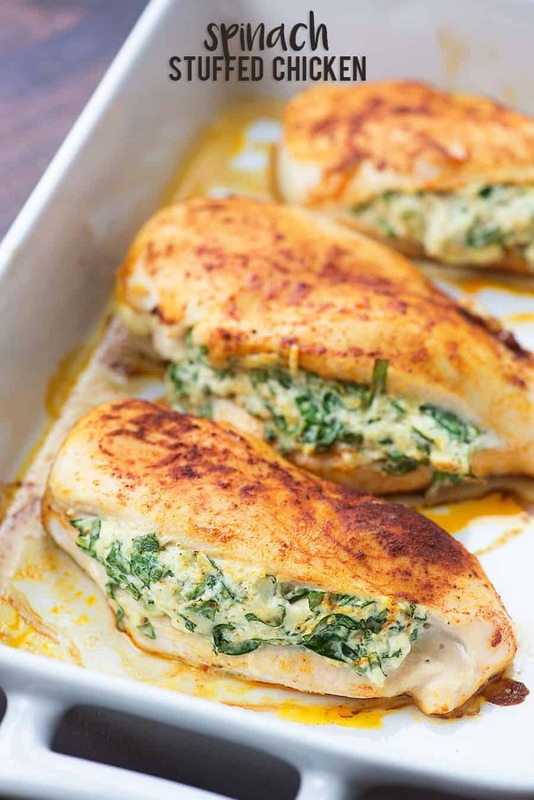 These spinach stuffed chicken breasts are loaded with cream cheese, fresh spinach, and Parmesan cheese. Place the chicken breasts on a cutting board and drizzle with oil. 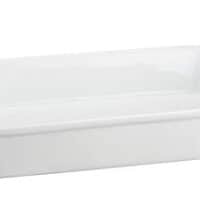 Place the chicken breasts in a 9x13 baking dish. Bake, uncovered, for 25 minutes or until chicken is cooked through. I’m wondering could pre-made Spinach and Artichoke dip could be used instead of making the filling from scratch? Perhaps! It might be more runny and leak out of the chicken during baking though. Made this dish tonight and we thoroughly enjoyed it! Glad a doubled the recipe so I have enough for dinner tomorrow and don’t have to cook! Thanks for your recipes! this was the yummiest chicken breast I have ever made. had no onion powder so just finely grated some fresh one into it as will as garlic and used frozen spinach and everyone was raving about it!! I just made this recipe and it was delicious. I will be making it again. 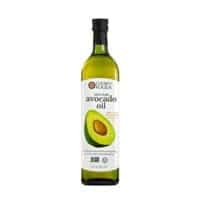 My husband and I have recently started Keto and this is now his favorite meal! He can’t get enough! Not sure if it’s just me or if anyone else struggled making those pockets in the chicken breasts, but I did learn that scissors make the job so much easier! I also melted sharp cheddar cheese slices (my husbands favorite cheese) on top of each chicken breast once they were done cooking and oh my goodness it was amazing! Absolutely fantastic recipe! I’ve never tried this with Velveeta. This was amazing! I didn’t use the red crushed only because my daughter finds it too spicy. I didn’t cream cheese (I thought I did, but it was moldy), so I used shredded mozzarella cheese. The beer EVER! My whole family loved it! I some asparagus along with it. We each had a whole chicken breast, yet no of felt bloated after this. We were and fill without feeling gross 1 highly recommend trying this dish! Thank you! Excuse my typos. My phone likes to type whatever it feels it should say. I made and enjoyed this recipe so much that I made it for dinner when visiting my best friend and her family. Let me tell you when a 5 year old suddenly yells loudly that “THIS CHICKEN IS AMAZING” you know you have hit the nail on the head! A very smart way to get some spinach that youngsters may not like into them! Thank you so much for sharing! I would divide the recipe in to sections. One for seasoning and another for filling. The “divide the salt” portion is confusing and I use this recipe for reference and I forget the salt for filling. Work this work in a slow cooker? Not sure how long I’d leave it on? I’ve not tried this in a slow cooker. No kidding… You have the pickiest mother in law EVER… and she LOVES THIS! She just moved in and dinners were almost unbearable from all she wouldn’t eat. (No pasta, noodles, cream sauces, rice! Can you believe it?!) Now, I feel I’ve got my mojo back! Thank you soooo much for sharing this new recipe! We ALL love it!! I’ve eaten this before and it was delish!! actually having it again tonight. I can’t eat mayonnaise so I leave it out. I do add some pepperjack cheese to it too. Awesome! Hi – for people substituting cheese (either goat or mozz) for the cream cheese, should it be melted before stuffing it in the chicken? Thank you! So looking forward to trying this tonight.